Disulfide By Design Software - A. Dombkowski, Ph.D. Try the NEW web-based DbD2 here. Disulfide by Design is an application for the rational design of disulfide bonds in proteins. For a given protein structural model, all residue pairs are rapidly assessed for proximity and geometry consistent with disulfide formation – assuming the residues were mutated to cysteines. The output displays residue pairs meeting the appropriate criteria. The input model will typically be a Protein Data Bank (PDB) structure for the protein of interest; however, structures developed through homology modeling may also be used. Engineered disulfides have proven useful for increasing the stability of proteins and to assist the investigation of protein dynamics and interactions. 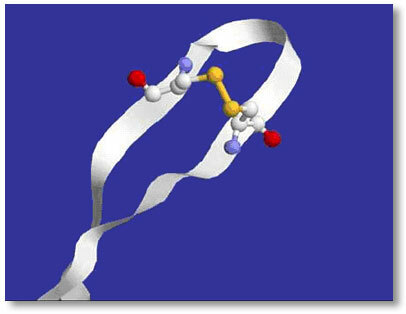 This software was written by Dr. Alan Dombkowski and based on algorithms created for disulfide identification in protein fold recognition methods. The Disulfide by Design algorithm has been successfully used for disulfide engineering (papers that have used DbD). Disulfide by Design is currently available for the Windows operating system. It has been tested with Windows 98, 2000 and XP. The application uses about five megabytes of memory and less than one megabyte of disk space. Monitor resolution should be a minimum of 1024 x 768 with 16 or 32 bit color. Click here to download a copy of the User Guide in Adobe Acrobat format. Disulfide by Design is freely available for non-profit use. Non-profit users can proceed to the download page by providing all the requested information below. For-profit entities interested in using Disulfide by Design should submit an inquiry to Dr. Alan Dombkowski, domski@wayne.edu.